My April 2017 trip to Costa Rica was a real eye opener for me in more ways than one. Apart from being one of the most fantastic places to visit, I learnt a lot about the live casino business and my studio visits gave me some real insights. The best visit by far was to the Visionary iGaming live casino studio. 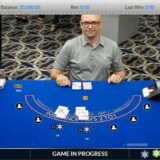 The video below will give you a glimpse of the day with some wonderful footage of me playing at being a live blackjack dealer. Hi, I’m Neil from Livecasinocomparer and you’re about to watch me deal some live blackjack hands in the studios of Visionary iGaming in San Jose, Costa Rica. I travelled there in April 2017 to have a good look around all of the studios that are located there and to get a better feel for the products and services that they are offering. 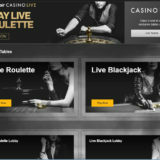 I’ve been collecting information on live casino games and software being used and the online casinos where you can play since about 2011. So it was an important trip for me to actually understand what the providers are doing and how they do it. Now you can see that the table is nothing special, it’s just a kidney shaped table although you can’t make that out in the video. The top is interchangeable so if they want to make that a baccarat table then they can just put a top on with a baccarat layout and it takes seconds for them to do that. The dealing shoe is a Shuffle Master shoe. It takes regular playing cards, there’s no barcodes on those cards, they’re the same type that are used in the Las Vegas casinos. Within the shoe, there’s two cameras that scan the cards as they are dragged out of the shoe. The dealer doesn’t have any options to get into the shoe and if there’s a jam or anything like that then one of the technicians has to come and open it up and deal with it. What you can’t see, but what I saw is on the other side of the table behind the camera, is a rig with two big TV screens. 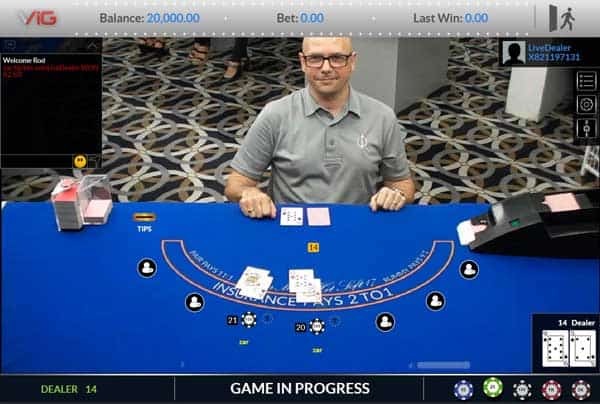 Now one of the screens contains all the details of the player chat that comes through and each player is given their own colour to make it easier for the dealer to see whose saying what. The other screen is the one that gives instructions to the dealer as to when they should deal cards and to what playing position. There is quite a lot of information that is splashed up in front of you in terms of what you need to do. You don’t see any bet amounts or anything like that which is quite interesting really and it’s a question that’s often asked of me, “Do the dealers know how much the players are betting”? Well at Visionary iGaming the answer is no. The playing positions in this demo were taken by one of the support staff and he rather annoyingly was playing the side bets as well. And I say annoyingly just because it was giving me a lot more information on the screen and it took me a few seconds to work out what the hell was going on. I was really concentrating hard and trying to do it. 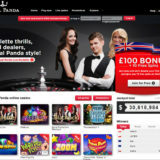 You suddenly realise although blackjack is quite an easy game to play and deal, when you’re in that environment it can become very difficult. So I’ve got a new-found respect for the dealers. I guess it’s like anything thought. The more you do something the more proficient you become at it. I was all fingers and thumbs. What is clear though with the Visionary setup is, if you make a mistake that‘s it! the dealer can’t and mustn’t try and fix it themselves. They have to call for support to come in. So games can take a little bit longer in Visionary just because of that. They don’t have the facility to do re-scans because the shoe is sealed, whereas something like Evolution Gaming, they can do re-scans because the scanning equipment is outside of the shoe. Now the dealers are measured by their mistakes, so I would have been fired probably. They’re not allowed near any of the tables until they have done a shed load of training and practising and while I was there I saw lots of that going on in other areas of the building. Now the pictures you’re going to see as well in this video are just general images of the live casino studio as I was walking round. And as you can see the studio is quite small and compact, but very modern and light and bright which is what you would expect. Still, I hope you’ve enjoyed seeing this behind the scenes look at a live casino studio and if you’ve got any questions please drop me a line. The information is on my website. 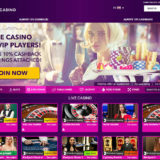 Or if you want more information about Visionary iGaming, the games they play or anything to do with live casino, my website is a good place to start. I hope you enjoyed it and I’ll be producing some more videos soon.